√ Pop Up: easy push up and break down in seconds by oneself alone. √ Lightweight: fiberglass frame makes this beach canopy only 4.7lb in weight for easy carrying. √ Ventilation: three zippered windows and two Triangular skylights for good Ventilation and view as well as privacy. √ The windows can be open or closed and the Odoland Shelter also includes a stake kit, sand bags and storage bag. Now it's Easy to Go to the sports field and beach and enjoy your day instead of fighting to put up your old traditional shelter. 100% Satisfaction Guarantee:1.If you are not satisfied with the quality of the product, please feel free to let us know and we will send you a new replacement. √. EASY TO SET UP in 2 minutes - Just stretch out the legs and pull the string to instantly set-up. 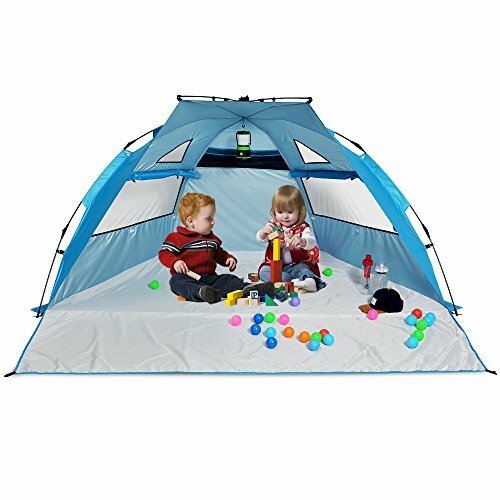 this beach tent comes fully assembled, can be set-up in 2 minutes.To take down just release the hub, fold in the legs and place into provided storage bag. √. LIGHTWEIGHT and BIG SIZE for Family- Weighs only 5lbs,The size when folded is 32" *5" * 5", Extended Long Size: 94.48"W * 51"T * 75.8"D. fits 3-4 people.This Good for enjoying the leisure time with your family or friends. √. UPADATED and FUNCTIONAL DESIGN - includes 5pcs sand pockets to provide stability for windy conditions, 4 plastic stakes to anchor in the grass;4 windows for ventilation,3 storage pockets under the rear window keeping your carry items like towel, keys,1 internal hook design for hanging a fan. √. UV PROTECTION and Good VENTILATION - This pop up beach tent UPF 50+ protection blocks 97.5% of harmful UV sun rays,4 large windows for ventilation,protection from the sun, rain and wind for all outdoor activities. If you have any questions about this product by Odoland, contact us by completing and submitting the form below. If you are looking for a specif part number, please include it with your message.